I made my first visit to La Côte St-Jacques twenty-one years ago. It was a remarkable experience. I knew, of course (who did not? 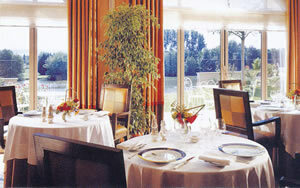 ), that the place had the top accolade which can be awarded to any restaurant. But I had eaten in dining rooms with three Michelin stars before, so I thought I knew what to expect. But I did not. I dressed, as I often did in those days when I toured France, in black tie. And I was so glad I made that modest sartorial effort, because it soon became apparent that everyone at this magnificent establishment was straining every sinew in the pursuit of culinary perfection. Everything exceeded my expectations. Little wonder, then, that I have been returning regularly ever since. Indeed, I would have been an idiot not to make these pilgrimages, having been given a glimpse of Heaven. To celebrate the 21st anniversary of that initial gastronomic counter, I again took my dress suit to northern Burgundy, as you may observe in the photograph of me with the Chef Patron. And once again I was shocked – for I encountered what must be, without doubt, one of the finest dishes in the world. You deserve a picture of this work of genius, so I have provided one for you. 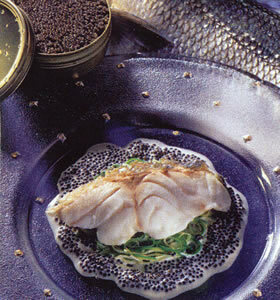 It can be described simply: lightly smoked sea bass with Oscietre caviar sauce. The combination is appealing, is it not? It is one of the classics of the kitchen here, but – strange to say – I had never tried it before. And now I know what I have been missing. The bare words of the description do not convey the subtlety, the delicacy, the exquisite balance, the yielding textures and the ravishing luxuriousness, which sent my palate into a state of rapture. If good food means anything to you at all, you should determine here and now that, before this year is out, you will sit at a table at La Côte St-Jacques and treat yourself to this revelatory dish. And drink with it, as I did, a fat, round white burgundy, laden with vanilla and creaminess (Puligny Montrachet, Leflaive, 2006 - 125€), and you will soar way above the clouds. A man who can provide me with such an experience deserves praise. So let me give him some. Jean-Michel Lorain is a gentleman – and I use that word carefully. Looking at the photograph of the great man with your correspondent, you might have a sense of his personal modesty. But Mr Lorain, modest though he is, is a hero of French gastronomy. At 27, he was the youngest chef ever to be awarded three Michelin stars. Since then he has had his difficulties – including, for a brief time, losing his third star – but he has sailed through them with courage, determination and supreme talent. There is no question whatever that he is one of the best chefs in the world. At his splendid hotel and restaurant – in Joigny, one hundred miles South of Paris – he ensures that each plate which leaves his kitchen delights the eye and caresses the taste buds. Truly, every gourmet worthy of the name longs for the day when he (or she) can visit (or return to) La Côte St-Jacques. So many grand people come to the door of number 14 faubourg de Paris, attracted by the gastronomic wonders, the elegant accommodation, the cookery school and the swish new spa, and yet the kind people on the Reception desk never look less than excited to see me. (I suspect they greet all their guests with the same smiling enthusiasm.) This must, I think, be a happy place in which to work. And why should it not be? 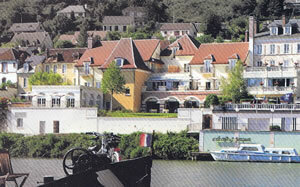 It overlooks the River Yonne; it is impeccably furnished and decorated; and it is famous wherever French gastronomy is celebrated. What is there not to like? I was soon in apartment number 32, on the second floor – a Deluxe Room and therefore 491 euros a night, bed and breakfast for two. 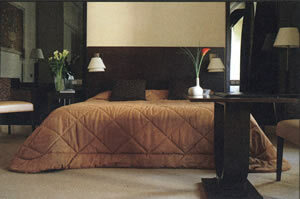 (This, as is the case with all the 32 rooms here, is very good value.) All around, French chic abounded. A handsome wooden door led into the corridor hall, off which was a door into the loo, wherein was a bidet. (There were lots of mirrors about the place, an abundance which reinforced the feeling of spaciousness.) The bed-sitting room I judged to be about 18 feet by 13 feet. 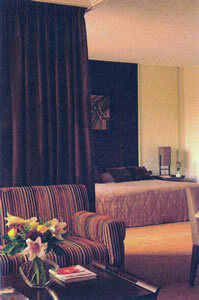 Its colour scheme of creams and subtle tones of brown created an atmosphere of calm and relaxation. There was certainly plenty of space for the glass-topped table in front of the fireplace. 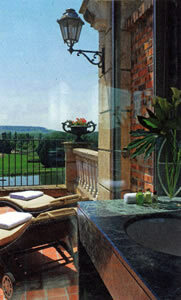 A French window led to my own private terrace, with its view of the river and the gently sloping hills beyond. Polished cream stone seemed appropriately impressive for the bathroom, which was theatrically grand. It had its own air-conditioning system and its own door to the terrace, as well as a large tub, a separate shower, two wash basins and a dressing table. Here I was able to soak – aided by the toiletries from ‘Pure Herbs’ – to the strains of Elgar from the cd player in the bedroom. The Dream of Gerontius really does make me feel dirt-free – spiritually and physically. Thus cleansed, I dressed in the dinner suit from Savile Row, adjusted the black silk bowtie around my stiff wing collar and sallied forth for dinner, eager once more to be in the shiny copper lift which transports guests down to the dining rooms. 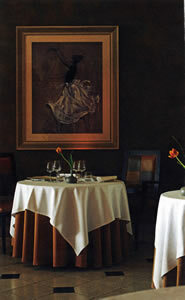 La Côte St-Jacques offers a comfortable environment in which to enjoy the pleasures of the table. 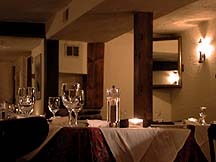 The surrounding colours are warm, the tablecloths are white, the armchairs are upholstered in leather and are properly supportive, the waiters are in black tie and the glassware is by Riedel and G & S. As you would expect at this level, the napkins of those diners who leave their places for a moment are immediately replaced. I was looked after exceptionally well by the Maitre d’ Thierry Gasparian and by assistant sommelier Clément Dumas. All was as it should be. Indecision is not among my many faults, but I was – as I knew I would be – slightly hesitant when I read the menu. Everything on the card was so tempting. Of course, I could have solved this little problem by choosing the Menu Surprise (215 euros), but I do not like gastronomic surprises, for there is too much pleasure to be had from the anticipation of what is to be eaten in a great restaurant. Or I could have gone for the six-course Menu Gourmand (175 euros), but I am no longer a fan of so high a number of courses. So I allowed myself a few minutes of agonizing, of the exquisite sort, before I announced my choices. And my decisions brought forth wonders. I must, however, begin with a tribute to one of the numerous appetizers which were brought to whet my appetite. This little piece of black pudding and mashed potato looked fairly uninteresting, but it was stunning to eat. Then I began the meal proper with crayfish, served with chanterelle mushrooms and young shoots, in a tomato jelly. Was this the best crayfish dish I have ever tasted? 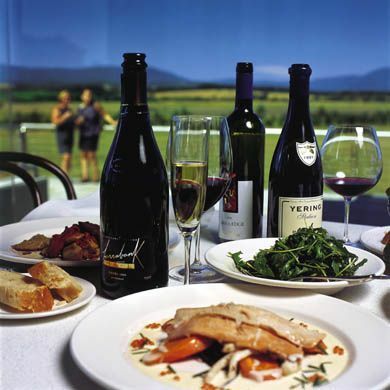 Quite possibly – and, certainly, the combination of tastes and textures made it one of the most intelligently conceived. Then came the miracle of the sea bass, over which I have already waxed lyrical. My meat was a hearty contrast. This delicious roasted duck came with green lentils from Le Puy, gratin of Jerusalem artichokes and truffle. I ended with another tour de force from this inspired kitchen: sweet and sour marinated cherries with caramelized cashew nuts and rhubarb sorbet. These four dishes from the carte cost 250€, and that seemed a bargain for food of such life-enhancing quality. At a three-star restaurant in France, you would expect to find a cellar full of the finest examples of French wine-making. 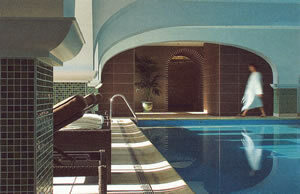 At La Côte St-Jacques your expectation will be fulfilled. The list has over 800 offerings, ranging in price from 23ε for a 2007 white burgundy aligoté to 7,875€ for the 2005 Romanée-Conti. There are other wonderful burgundies – like 2000 DRC Montrachet (4,039ε) and 2006 La Tâche (2,261ε) – but my eye was caught more by the collection of old clarets, from which I will mention just four: 1928 Cheval Blanc (3,300ε), 1928 Haut Brion (3,900ε), 1934 Margaux (2,290ε) and 1945 Lafite (3,500ε). For my own drinking, apart from the white burgundy, Monsieur Dumas suggested a red Beaune with a lingering aftertaste (Clos des Mouches, J.Drouhin, 2005 - 78ε, half). After this feast, I supposed that I would want little breakfast the following morning. I supposed erroneously. In a room by the garden, once more overlooking the river, I tucked in like a good trencherman to pastries and breads, orange juice, cereal, poached eggs on toast, smoked salmon and cheese. And then, sadly, it was time to go. My first visit had been 21 years previously. Then I had been surprised by the excellence I had found all around. On this occasion I had been quite overcome by the sheer brilliance of the food. The experience of that sea bass will live with me as long as I draw breath. Great chefs can give us such memories. 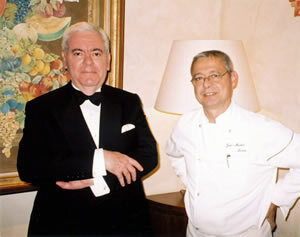 And there is no greater chef than Jean-Michel Lorain. 14 faubourg de Paris, Joigny 89300, France.